Marvel Superhero T-Shirts | Nerd Much? You'll stand out in a crowd, that's for sure. Looking to wear your Marvel pride this year? 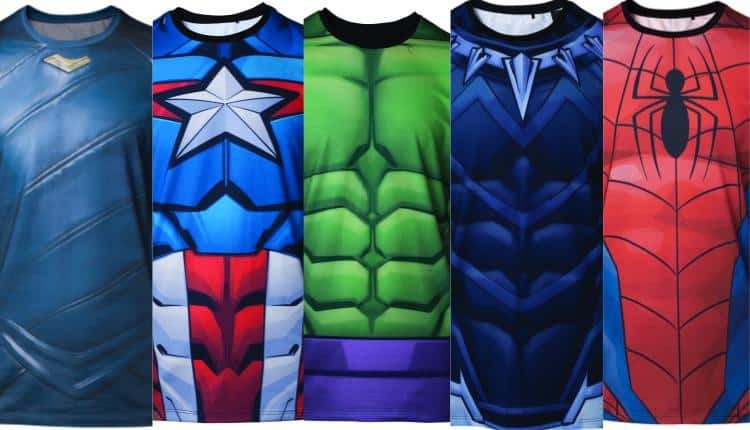 Look no further than this selection of Marvel Superhero T-Shirts. You can get Hulk, Loki, Captain America, Spider-Man, and Black Panther. All members of the Avengers, though Loki might be a little debatable depending on which universe of comic books you’ve read. These shirts are respectably long and made of a soft material, a polyester blend. As such, it’s not as breathable as one might prefer. With such bold colors, these shirts make bold fashion and nerdy statements. You’ll stand out in a crowd, that’s for sure. The Hulk: Stop, Banner Time t-shirt is the bright green chest of Hulk, rippling muscles and all. To further the illusion, the bottom of the shirt sports the telltale purple pants, so iconic of the character. Why his pants are always purple when Banner transforms, we’ll never know. But this superhero can only tear through so many clothes before being deemed inappropriate. The Thor: Mischief Maker t-shirt design might be a little misleading, but if you’ve watched Thor: Ragnarok you’ll recognize Loki’s armor here. Though in the movie he was dolled up in green and black, this shirt is distinctly the dark blue normally associated with Thor. Since Loki is indeed a mischief maker, and a shapeshifter, it seems perfectly logical that he would mix up the look a bit to confuse people. The Captain America: Super Soldier Sublimation t-shirt is Cap’s old school armor, or new depending on the film you’re watching. All the star-spangled colors are present: red, white, and blue. The star is white and emblazoned on the chest with the red stripe behind it and blue background. Below the pectoral area are red and white vertical stripes. Though shaded with a little more black, this shirt is still quite brightly colored. The Spider-Man: Peter Parkour t-shirt has, as usual, the spider logo in the center of the chest. It sits on a web against a red background, bracketed by bright blue stripes. As with all of these shirts, the illusion and lines mimic muscles and that line leading to that area. It is particularly conspicuous with this Spider-Man shirt. How Will Gambling Laws Affect Video Games?